The wisest man on earth passed the test. 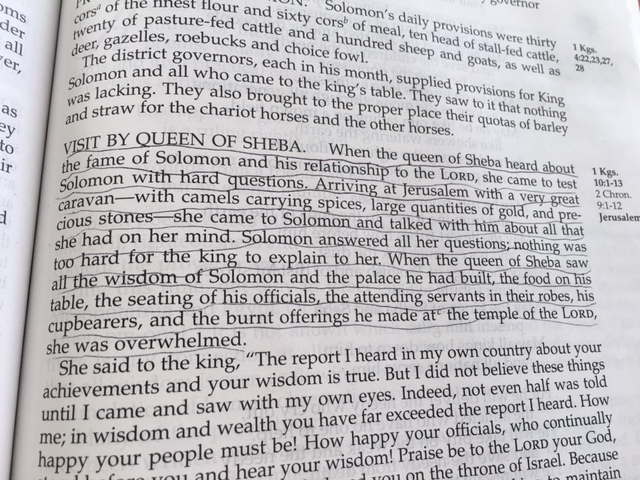 In 1 Kings 10, we read that one of the most famous queens of all time – the Queen of Sheba – went to visit King Solomon. To see if he really was wise. She arrived in Jerusalem in a “very great caravan with camels carrying spices, large quantities of gold and precious stones.” (vs 9). Can you imagine what this caravan looked like? The Queen of Sheba took this huge group over 1200 miles through the hot desert which was filled with bandits and thieves to talk to Solomon about all the things she had on her mind. And Solomon answered all of her questions. After Solomon passed his test, she praised ‘the Lord your God’ for the wisdom she saw in Solomon. When she left, Solomon gave praise to God for all of his marvelous works and for all of the blessings God had given him. In a way, Solomon passed another test. He knew where his wisdom came from and he made sure to thank God for it. May we be faithful in following his example.